For every great welcome offer, there are ten bad ones. Finding a valuable bonus isn’t an easy thing, but doing so may result in a nice profit boost. Therefore we have listed what we believe to be the 5 best eSport bonuses of 2017. What is it that makes an eSports bonus great? * The maximum amount of bonus money that can be received. * How much we would have to deposit to receive this. * How many times the bonus must be wagered. * If there’s a time limit to the wagering. * What minimum odds the bonus must be wagered on. There may of course be other factors that would have to be considered as well. For instance if all money used for betting will count towards the wagering or just the bonus money, or if the minimum eSports odds can be reached through a combination of bets or if it has to be singles. This is all something we have taken into consideration when deciding the top 5. Below you will find the list of what we consider being the 5 best eSport bonuses of 2017. As some bonus offers are only available for some countries, we have together with the above factors also been taking this into consideration when deciding the top 5. This means that we don’t necessarily list all the best bonuses if these were only available for one country. Instead we have mixed it up and tried to reach out to as many as possible. Please note that EGB’s bonus has been massively reworked since this article was released. They still offer a cashback, but it’s not nearly as good as it previously was. Below you’ll find information about the current bonus. Please note that it’s no longer the top one. 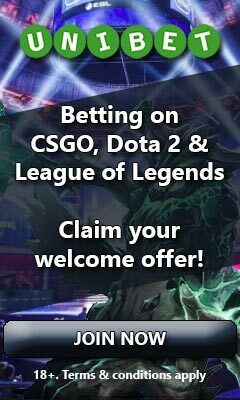 EGB is a pure eSports betting site that does a great job providig an awesome eSports experience with lots of bets, live streaming, a player chat and much more. Their welcome offer is however unfortunately not the best at the moment. As a new player with them you’re able to get a total of $600, which is based on 100% your first deposit. If you deposit $100, you’ll be able to get $100 and if you deposit $600, you’re able to get the full amount of $600. This money is not instantly credited, but will be paid out as a cashback in blocks of five. If you for instance deposit $100, you’ll receive $20 each time the condition for the cashback has been met. EGB has a player point system where you get 10 player points for every $1 you wager on odds 1,3 or higher. For every $1 in cashback money, 500 points are needed. This means that if you would deposit $100, you would need a total of 50,000 points, whereas $20 will be released to your account every time you get 10,000 points. If you’re only placing bets on odds 1,3 or higher, this would be equal to a 2% cashback. EGB does however also have a shop where player points can be spent to buy bonuses or pure money. You can for instance get $1 in pure money for 1000 points. As the points are not consumed by the welcome offer, you’re able to use them in the shop while still getting the cashback, which will boost the overall value. They also offer daily quests that reward player points when completed, which furthermore can boost the overall value some. Even though the cashback is not the highest, a good thing about EGB’s bonus is the fact that you’re able to withdraw profits without losing the bonus – on one condition. You always have to leave your balance higher than it was on the first deposit. As long as you do that, you’re able to withdraw any profits you like and still be able to keep the bonus for its full period of time, which is 3 months. Another good thing is that the offer is available for anyone who is allowed to sign up and can also be taken part of by depositing with e-Wallets like Skrill and Neteller. Get EGB’s cashback bonus here! Belgium, Germany, Luxemburg, Netherlands and Switzerland. Ranked as number two is a really nice risk free bet by betFIRST. Unfortunately only players from the above listed countries are allowed to play at betFIRST, so unless you’re residing in any of those countries, you unfortunately won’t be able to take part of this offer. For those lucky enough living in the above countries, a risk free bet up to €100 awaits, which is a really high amount for this type of bonus. Unlike other risk free bets you might have come across, the stake won’t be returned as your own money if you lose, but will be returned as bonus money that needs to be wagered. This might not sound very good, but there’s a reason for this offer being ranked as number two; the stake returned only has to be wagered once at odds as low as 1.2 or higher. With this bonus you could deposit up to a €100, take a shot and bet it all on higher odds than you usually would. How high the odds would be is of course entirely up to you, but let’s say you would bet it all on a combination of bets giving you a total of 3.0 in odds. If you win, you would then be paid out €300 which you could instantly cash out, making an easy €200 profit. In worst case scenario you would lose, but then you would have the stake returned which is easily wagered on such low wagering requirements. As an extra added value to the bonus, betFIRST has a campaign in which you can receive €10 back if your first mobile bet loses. This campaign can be added together with the welcome offer, which means that if you would place our example bet of €100 on their mobile page, you would have €110 returned if the bet is lost. The wagering requirement of the €10 is however a bit higher as this would have to be wagered once on odds with 1.5 or higher. Please note that the stake of a losing bet won’t be returned automatically, but an e-mail with the subject line “lucky bet” needs to be sent to their support within 7 days of the losing bet. Click here to caim your riskfree bet! Finland, Norway, Sweden, Austria, Germany, Liechtenstein, Luxembourg, Switzerland. Yet again we must unfortunately list a bonus that not everyone is able to receive, but if you are from one of the above listed countries, Betway’s welcome offer will give you a nice deposit bonus of 100% up to €100 or €150 (depending on where you live). This has to be wagered 6 times on odds 1.75 or higher, or 48 times on odds between 1.3 and 1.74. There may be other sites that offer a bit lower wagering requirement than this, but the really nice thing about Betway’s bonus is the fact that there is no time limit to the wagering, the flexibility it gives you and amount you can receive from it. If you wish, you could have it wagered quickly by placing bets with at least 1.75 in odds and as a combination of bets can be used to achieve this, you could for instance place a combination of three bets, each having 1.21 in odds. If you on the other hand want to play it more safely, you could also wager the bonus with a combination of only two bets having an odd of 1.15, as this would be greater than the required 1.3. This would of course take a lot longer, but as there is no time limit to the bonus you don’t have to rush it. Visit Betway and get a 100% bonus! As Unibet’s welcome offers to vary a lot depending on where you’re from, it may be questionable having them in the top 5. For some countries the offers are definitely better than others and Portugal’s offer is for instance one that wouldn’t even belong to the top 10. The thing is though that most of the offers are considered good and for some countries they’re good enough to be ranked as number 2. Therefore we agreed that Unibet’s bonuses overall were good enough to receive the fourth spot. As the offers, along with the terms and conditions vary a lot, we highly suggest just visiting Unibet and choosing your country to see how good of an offer you’re able to take part of. Check out Unibet’s bonuses here! As a new registering player with Bet365 you’ll get a 100% deposit bonus up to €50. To receive this, a bonus code sent to your e-mail on registration must be entered to your account. Your deposit must then also be wagered once on any odds before the bonus money is credited. Once credited, deposited money + bonus money received must be wagered 3 times within 90 days on coupons with at least one option having an odd of 1.5 or higher. Even though a wagering requirement of 1.5 may seem a bit high for a single choice, we would say it’s good enough to be ranked 5th considering the bonus can be used by many and has a long time limit of 90 days. Claim the 100% bonus at Bet365! We know that there are some bonuses for some countries that may be better than some of those that we have listed above. In this article we did however aim to reach out to more than just a few countries. Please note that the campaign offers in this article may change after it has been published.